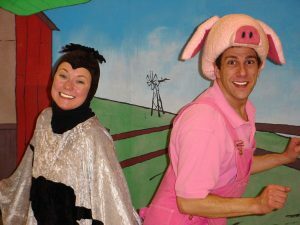 The beloved children’s book Charlotte’s Web will be brought to life in a musical performance for children in grades K-4 on Monday, January 16 at 10:30am at Cutting Hall Performing Arts Center, 150 East Wood Street, Palatine. Charlotte’s Web is the story of a pig named Wilbur and his friendship with a spider named Charlotte. When Wilbur’s life is put in danger by the farmer, Charlotte writes messages praising Wilbur (such as “Some Pig”) in her web in order to persuade the farmer to let him live. This is a beautiful, knowing musical about friendship that will give your students an opportunity to see one of the most popular children’s books of all time come to life. Tickets are $6.00 per person and can be purchased in person at the box office, by phone at 847.202.5222, or online at cuttinghall.org. This performance will be presented by American Eagle Productions as part of Palatine Park District’s Family Friendly Theatre program. Palatine Park District’s Family Friendly Theatre productions offer a convenient local option for introducing children to the theatrical experience. Shows are usually an hour long and are offered in a comfortable atmosphere in the heart of Palatine at the Cutting Hall Performing Arts Center, 150 E. Wood Street, Palatine. For more information, visit cuttinghall.org, or contact Jacob Ellison at 847.496.6237 or jellison@palatineparks.org. The mission of Palatine Park District is to provide a variety of safe, enjoyable and affordable parks, programs and recreational facilities that will enhance the quality of life by promoting good health and well-being for all residents and visitors while being fiscally responsible stewards of community assets and tax dollars.